Some schools have cutting edge facilities and curriculum...this one just has a lot of cutting edge! When Aichi Coexistence Academy converted from all-girls to a coed model, the female students were so concerned about male misbehavior that they armed themselves! Now the school is ruled by the lovely but lethal Supreme Five Swords, and the boys are forced to dress and act like girls or suffer the razor sharp points of the Swords' anger. Unfortunately for the Swords, new transfer student Fudo Nomura thinks that sounds like a total drag, and he might just have the martial arts chops and rapier wit needed to slash through the Swords' defenses and carve a new niche for himself in their feisty feminine hearts! It's a whole new kind of slice of life High School Drama, extra heavy on the "slice", as one Bad Boy meets some very Dicey Girls! 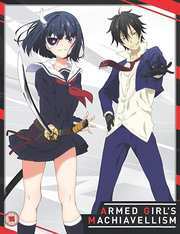 Armed Girl's Machiavellism the Complete Collection contains anime episodes 1-13. Contains 6 artcards and a 240 page artbook.